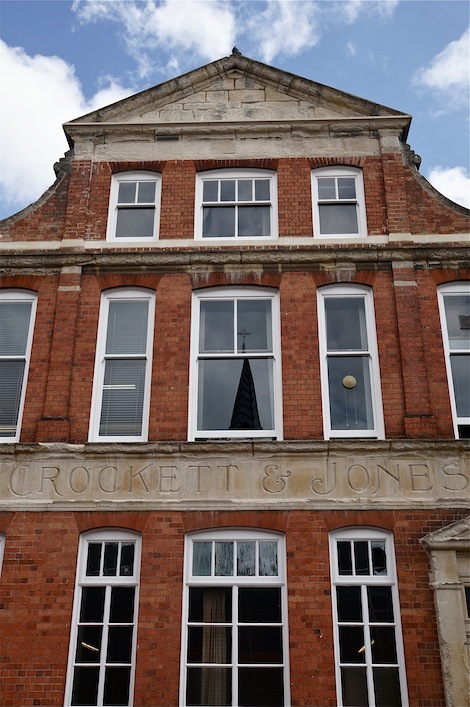 Last week I was in Northampton visiting a few of the shoemakers, particularly Crockett & Jones and the new Gaziano & Girling factory. I have never owned any Crockett & Jones shoes. But I have heard so many great things from friends and colleagues that I have never had any hesitation in recommending them, unlike any other brand I haven’t tried myself. Seeing them being made added greater confidence to that recommendation. 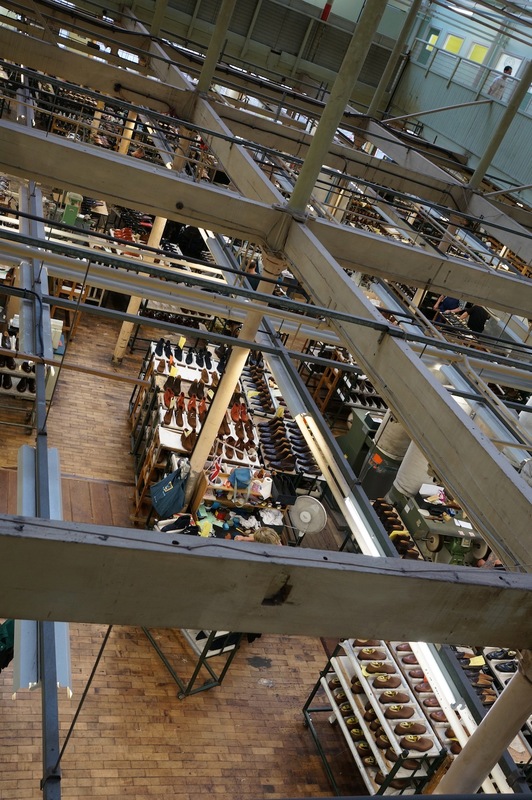 Crockett & Jones is a big factory. It is the second biggest in Northampton, after Church’s, and dwarfs the likes of Edward Green or John Lobb. 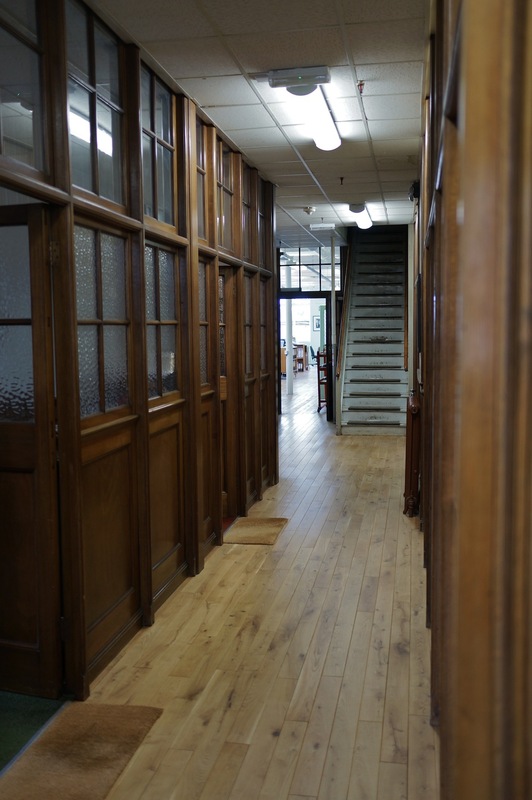 There are seven big rooms across several floors of the building, which takes up half a city block. C&J moved here in 1890, and the factory still has lovely wood floors, frosted glass and well-worn handles. Like the lovely John Smedley factory in Matlock, it will remind American readers most of an old British school in a black-and-white movie. The biggest thing that sets Crockett & Jones apart from its competition – for a shoemaker of this size, and this quality – is its range. Any other producer making up to 3000 shoes a week would have a much smaller product line. At one point James Fox and I (head of online and husband of Philippa Jones, daughter of owner Jonathan Jones) looked around the carts of shoes in the finishing area. There were 40 different styles of shoes, from brown brogues to burgundy boots. One reason C&J has such a range of lasts, colours and styles is that it works with dozens of retailers around the world, all of whom order their own, specific designs. There is still a lot of product development in house: it is the key strength of Jonathan Jones, the owner. But he receives constant feedback from the various retailers, where other brands concentrate more on their own ranges and stores. It is also unusual for a factory of this size to have so many individual, specialist operations. They are more likely to have automated processes and track systems, where people do one small task and put their product back on a moving track. The processes here are much more similar to Edward Green or Lobb. One other fact about C&J production: around half of their shoes are hand-clicked, and half use a press knife (clicking room below). There is little difference in quality – the key skill of a clicker is working the leather, not cutting – and it tends to be the core styles that use a press knife, as it is worth investing in all the metal shapes for a new style (7 or 8 per shoe, in every size). I thoroughly enjoyed my visit to Crocketts, particularly the people. I saw Cliff Roberts again, who works there. It’s easy to be optimistic about the company, with James and Philippa the next generation. And I particularly enjoyed talking to Nick Jones, Jonathan’s brother, who runs the production as well as his own farm. This is the archetypal Englishman for me: not a black-tied poser smoking a cigar in his club, but a man of modesty, enthusiasm and the slightest touch of silliness. Michael Palin; not James Bond. Long may the family continue. You can follow the discussion on Crockett & Jones: the factory, the shoes, the people by entering your email address in the box below. You will then receive an email every time a new comment is added. These will also contain a link to a page where you can stop the alerts, and remove all of your related data from the site. I have been a huge fan of C&J for years. Not only do they have a great range of styles, but they also do something that no other Northampton maker can come close to. They are comfortable to wear straight out of the box. Super article about a super English company. The leather situation is a continuing problem and will always be so I fear, due not only the luxury bag makers effect on supply but also the amount of hides going to the Far East coupled with people eating less red meat. Investing now in good quality long lasting goods will pay dividends. It’s interesting that Church is the biggest factory. I wonder who is N3? Alfred Sargent? Sargent, Cheaney, Loake and Barkers are all pretty big. With Loake and Barkers it’s hard to tell exactly though, as some of their production is done in India now. I had the impression prices had gone up, but they are comparable to C and J and the latter are not owned by a fashion house. I bought a pair of Church’s Shannon 12 years ago for a little under £300, and the same model is now £450. I was shocked at first when I saw that the price had gone up so much, but then I reflected that the price of many other well known brands is kept artificially low by outsourcing production to India, China etc. I think there must have been a similar trend in bespoke suiting. Less than ten years ago Douglas Hayward charged 2500 for a three piece suit, but last year a three piece suit from Hayward’s was £4500. In its price range, C&J is my favourite maker. The lasts, materials and finishing is top-notch, and their whole range is definitely among the largest on the market. They do have a MTO program for the most specific wishes but the surcharge is closer to 50%. I’ve owned several pairs over the years and C&J never lets me down, though I wish they’d offer more models in shell cordovan. I have my wedding in February and I am looking to buy a good pair of shoes but the issue is that I am in India and I have to ask my cousin to buy me a pair. I am looking for something that is classic and very comfortable to wear (I plan to wear them for formal occasions and business event later on) My budget is around $700-$800. Could you suggest me what would be the best brand? I have the following on my mind; C&J, EG, Loake, Grenson, Church’s, etc. Crockett & Jones is still an industrial product. This means rationalization and cutting costs compared to bespoke. The French and German shoe forums depiedencap and newsaboutshoes had some cordwainers take some pairs of C&J’ shoes apart. The picture under the upper leather was not that bright at all. C&J uses cheap synthetic reinforcements in the front and heel, a wooden shank was placed wrong in a so called “handgrade” pair, moreover the shanks were broken in more than 1 pair after just some wear, the upper of the shoe was placed in a deviating angle on the heel and almost no pair of C&J seems to stand even on the floor. I own several pairs of C&J shoes and am happy with them. But they just represent a certain value between cheap and bespoke shoes. Their quality is very relative. However, C&Js marketing pretends they are more. E.g. I wonder how much hand there is in “handgrade”? I don’t think Crocketts pretend to be anything like bespoke shoes. There will always be rationalisation, of course, and the quality will never compare to bespoke shoes that cost almost ten times as much. I like the approach of writers investigating product and taking it apart, but they all seem to act as if all brands are trying to pull the wool over customer’s eyes. Fashion brands may be, but English shoemakers largely are not. 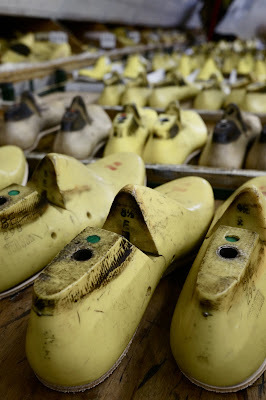 It’s much more instructive to see the shoes being made – you see hundreds of pairs rather than one, you see the care and the materials that go into them, and you see the skill of the staff making them. Much more satisfactory than reverse engineering. I’ll let Crocketts answer the technical points you mention. I see your point. Thank you for taking your time to respond to my criticism, it is much appreciated. Great to read this piece. I worked in the pattern room in the 1980s. 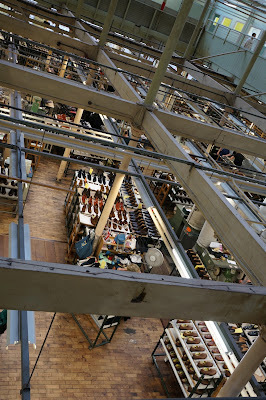 The processes involved in the manufacture of a shoe are many and varied and all the workers have to be experts in each. 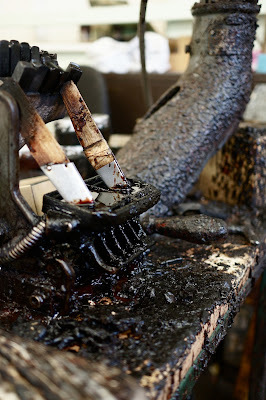 Only top grade shoes,whether they be handgrade or benchgrade are sent out from the factory otherwise they would be committing commercial suicide. Bespoke shoes were made by an old chap and took many many hours of fitting ,building up the last and altering the pattern . When that one shoe went around the factory it would need individual procesinging, ie changing thread on machines, altering settings on others, all these processes time consuming. Although the processes involved in producing a shoe are the same,it take much longer to do a bespoke. With regard to the shanks there maybe some variables out of C&Js control as to the reported problems.Dodgy batch of shanks for example. Is Frank aware of the nuances between Bench and Hand grade? Also he reports the C&J shoes were uneven on the floor, well after wear its not surprising, as we all have leg length inequality which will cause differential sole wear. I just want to know about the price of a pair slipper silver crown size 9. I’ve read that a lot of C&J shoes are rebranded and sold by Shipton and Heneage for a lower price. Or, to put it the other way around, Shipton&Heneage shoes tend to be either C&J or AS shoes with a different stamp on them and sold at a discounted price. I wonder if there’s any validity to this. If so, why would the companies allow that? Is it to get rid of old stock, or does S&H simply outsource production to the C&J or AS factories. Is there any discernible difference in quality of construction or leathers? It would be interesting to know how this aspect of the luxury shoe market works. Hi Simon, what shoes would you recommend someone just entering the workforce with a limited budget (~£150)? I’ve been told that Loake and Russell and Bromley even at full price would fall within this price range. In your experience, would it be a better idea to spend (quite a lot more) on quality from places such as Crockett Perhaps they might even fall within such prices in the post-Christmas /January sales? Yes I’d aim for Crocketts or Cheaney if you could. And definitely try for sales! Am enjoying your articles on shoes and your insight into the C&J factory. Living in Singapore as an expat there is nowhere to buy good English shoes but as you pointed out there is a lot of high fashion brands here. Will has to buy online I suppose but thanks for writing such useful background articles for us overseas chaps out in the tropics. I wish they offered more in wide fitting .Thank you. I’m wondering what the benefits are of paying the premium for handgrade shoes. For a company like Crockett and Jones, is the hand grade line superior in terms of construction and longevity? Or is the benefit more about the aesthetics and appreciation of the craft involved? Thanks Simon. I guess what I’m really trying to get at is the benefit of handwork in construction. Does it afford benefits in durability or comfort; or is it preferred for aesthetics and/or appreciation of the craftsmanship involved? Or, if it is easier to respond this way, in what parts of shoe construction does handwork afford functional benefits in terms of durability or comfort? Good questions. The extra care with the handwork is largely small, aesthetic improvements. It’s more the grade of the materials that is noticeable, and even there the benefits are largely aesthetic rather than about comfort or longevity. So the upper might respond better to polish, and look better as it ages if you continue to polish it. But if you’re not going to put that kind of work into it, the benefits are far less. Simon – would I be correct in thinking that Crockett & Jones shoes are of a slightly higher quality than that of Cheaney? Thanks SImon. Where would you place Loake in this? Comparable to Cheaney? I am interested in a Dark Brown Suede Chukka boot and am considering the C&J vs. Vass. C&J is $540 (USD); Vass, via NMWA, is $825. Can you offer any comments on which would be superior in terms of quality of materials and quality of construction? Vass is handmade; C&J model is from their Main Line collection. Thank you for any comments.